How did we transition from being a one team club by the name of Arsenal to a 60-member social club with a depth of experience and exuberance? It only took us 20 years! We relive the first 20 years of Highbury Korfball Club, an anniversary which we will be celebrating in September 2018. 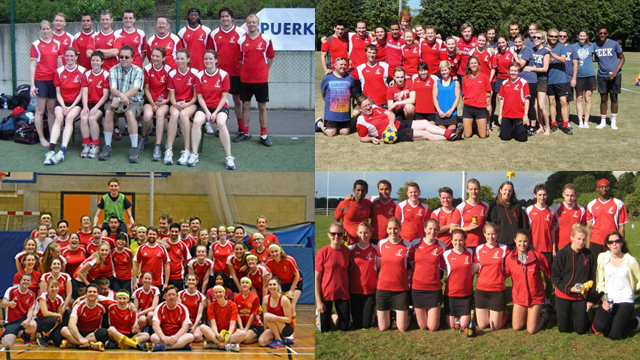 Small but perfectly formed, we began life as Arsenal Korfball Club in 1998. Established by Hugh Barker, and some of his former University of Cambridge teammates, we competed in the lowest tier of the London leagues dressed in (fake!) Arsenal football replica kit. It took some eight years and a name change for us to attract enough players to enter multiple teams. The club was based at Highbury Grove School, a venue which would later give the club its new name. In the early days we were a magnet for London-relocated Castle Korfball Club players, attracting Matt Day, Kirsteen Henderson, Arnaud Chevalier, Stuart Hall, Theresa Hall and Sam Larkham. In 2002 long-serving club coach Hugh Barker moved to Cambridge and was succeeded by Matt Day. However when Matt, along with Kirsteen Henderson, moved to New Zealand a year later the future of the club was in jeopardy. A new era was signalled with a change of name – to Highbury Korfball Club – and the replacement of the Arsenal kit, with a red number of our own. Sam Larkham, who incidentally was a Tottenham fan, took on the coaching. Contrary to popular belief the club changed its name because of an assumed connection between us and Arsenal FC from intrigued fans, not because of Sam’s team affiliation. Although, he was no doubt delighted with the change! We continued to train at Highbury Grove School – outdoors, even in freezing winter conditions. The fresh start in 2003 by no means signalled the beginning of an upward trend in training attendance and league performance. We did not even enter a team into the league for the 2003/04 season. Without the appeal of league korfball we were not attracting many players. Perhaps unsurprisingly, in the 2004/05 season when we were able to enter a team, we finished bottom of the London District Korfball Association (LDKA) league. A number of key events in 2005 transformed our fortunes. Martin Jones, formerly of University of East Anglia (UEA) Korfball Club, moved to London and was soon appointed as coach. His positive outlook bolstered our training attendance for the first time in years. A few months later, Tottenham Korfball Club folded and several of their players joined us, including Shah Munir, Gawain Bosworth, Carolyn Graham, Ben Hale and Gordon ‘G’ Cook. Other experienced korfball players joined during this period, including Toby Catlin of Norwich City and Sophie Robins of UEA (aka Highbury’s sweetheart), the Adelaidean trio of Tom Bukojemski, Natalie Shield and Andrew Speck – who all subsequently represented Australia at international level, along with Ben Hale. With a new coach and a bunch of new, but experienced, players, we transformed our bottom place to runners-up of the LDKA First Division 2005/06 season, narrowly losing out on top spot to Bec 3. During this season, we created our first constitution and established a committee, initially comprised of Susan Moore (Chair), James Medhurst (Secretary), Martin Jones (Coaching), Sam Larkham (Fixtures) and Matt Wooden (Social). Many other members joined us in 2006 and would go on to be play important roles in the 1st team for years to come – Rachel Dixon, Sophie Scott and Moses Hutchinson-Pascal (the single most important event in Highbury’s history, according to Mo! ), all korfball newbies. We were also starting to attract international players with good experience too. Notably Olga Sanderova from the Czech Republic, New Zealand international Julia Hall, Edith Hornick from Luxemborg and, from the home of korfball, Leonie Ansems De Vries joined us. Edith and Julia went on to represent their countries on the international stage. We went on to enter two teams into the London leagues for the first time in our history, with Highbury 1 playing in the LDKA Premier Division and Highbury 2 in the LDKA First Division. In the 2006/07 season Highbury 1 finished second to West London Wildcats (containing future England internationals) in the LDKA Premier Division and Highbury 2 finished fifth in the LDKA First Division. 2007/08 saw another key event in Highbury’s history with the appointment of our first external coach, (former GB international player) Tamara Burnell. We also entered three teams in the London leagues for the first time. Tamara coached Highbury 1 and 2, which enabled Highbury 2 player Ben Hale to coach Highbury 3 (featuring a young Niccola Hyslop in her debut season). Tamara’s professional approach to training ushered in a new era at Highbury, as she challenged players to think much more tactically during games. Highbury 1 and 2 won their respective leagues comfortably – the LDKA Premier Division and the LDKA Second Division respectively. At the end of 2007/08 the 1st team competed in the play-offs, defeating Tornadoes in the semi-final but losing to Tamara’s Supernova in the final. However, a few days following the final, Supernova declared that they were stepping down from competing at that level and we were offered a place in the South East Regional League. We would go on to compete with the likes of Bearsted 1, Tornadoes 1 and Nomads 1 the following season. Highbury 2 were so good we were offered the opportunity to skip the LDKA First Division and replace Highbury 1 in the LDKA Premier Division. The club also competed as a mixed Highbury 1 and 2 team in the Midlands Regional League alongside Milton Keynes, Birmingham City and Cambridge City that season. Redevelopment of Highbury Grove School necessitated a mid-season move of training venue to Acland Burghley School in Tufnell Park. We were recruiting players so well that we entered four teams in the 2008/09 season. However, it was a tough season for both Highbury 1 and 2 who each managed only one victory each in the 2008/09 season (Mo being the only player to feature in both victories, which he says speaks for itself!) and consequently finished bottom of both leagues. The 2009/10 season was another key time in Highbury’s history. Tamara Burnell’s two-year stint as Highbury 1 and 2 coach ended and established Highbury 1 players, including Sam Larkham, Arnaud Chevalier, Toby, Catlin and James Phillips, left the club. However, Bec player Stuart Ironmonger took over the coaching of Highbury 1 and 2, and for the first time our squad trained indoors, in a small hall in Bermondsey. Having finally joined the 21st century, Highbury 1 also returned to London competition to play in the inaugural London Regional League (Highbury 2 were relegated to the LDKA Second Division, which was effectively the old First Division). Stuart’s positive approach and the recruitment of several new players, added to the benefits of training indoors during the 2009/10 season, helped Highbury 1 to finish the season in 2nd place, which remains our highest finish to date in the London Regional League. This also qualified Highbury 1 for the inaugural end-of-season play-offs at UEA Sportspark to determine which teams would be promoted to the National Premier League (the First Division having been scrapped). Highbury 1 played teams from all over the country, including some that are still established in the Premier League today, e.g. Tornadoes and Norwich Knights (featuring a young Steph Allen!). The 2010/11 season saw Highbury 3 promoted. However difficulty fulfilling fixtures saw the fourth team struggle, and ultimately a 4th team would not compete again for a number of years. Stuart Ironmonger disappeared and was replaced as Highbury 1 and 2 coach by former player Arnaud Chevalier, assisted by Ben Hale. Highbury 1 and 2 also moved their indoor training to Score in Leyton but Highbury 1 narrowly failed to qualify for the end-of-season play-offs. The club was having some financial issues with rising hall costs and depleted player numbers to pay for them, the club committee made many decisions affecting the club’s stability to be able to ensure the long term viability of HKC. These included changing home matches to St Augustine’s School in Kilburn from Score in Leyton. The club regularly needed to break into its minimum cash levels just to stay afloat. Following issues with both match venues the previous season – St Augustine’s and Score, we decided to temporarily play our home fixtures at Supernova’s home venue – Millwall FC in South Bermondsey. Despite intending it to be a one season fix, the club would go on to play four seasons at Millwall. Supernova 1 player Martin Petrie was appointed head coach for the 2011/12 season. We only entered three teams in 2011/12, due to dwindling player numbers. With Highbury 3 playing in the LKA Second Division, and no team in the bottom division, it was relying on new players like Rich Hayward and Conor O’Boyle and promptly lost all but one match. Some prominent members of Highbury 1 departed that season and, despite arrivals of future stalwarts like Darryl Light and Georgina Gilchrist, the club couldn’t stem the tide of the club shrinking. However, Highbury 1 qualified again for the end-of-season promotion play-offs at Whitgift in Croydon and narrowly failed to be promoted after winning two matches, which remains our best performance in the play-offs to date. As we were losing players, we still needed to save money. The hall at Petchey Academy where we had been training was deemed too expensive and an alternative was sought for the 2012/13 season. The chosen hall was a cheap alternative and a great location right next to Old Street station. However, the walls were not even and the roof was too low for a long shot, which unsurprisingly proved problematic for korfball training! Martin Petrie left as coach and, with the club unable to secure an external coach, long-serving Highbury player Andrew Speck agreed to coach Highbury 1 and 2 for the 2012/13 season. Highbury 1 and 2 also experimented with training fortnightly at Clissold School in Stoke Newington. Highbury 1 qualified again for the end-of-season promotion play-offs. The 2013/14 season saw our nomadic existence continue with a move to another new training venue – the relatively new Swiss Cottage Leisure Centre. This move brought about a dramatic changes in fortune that would set the tone for the years to come. The club recruited some 25 new players during the season, including several Highbury 1 players. New recruits like Karthik Ramulu, Elin Watkins and Greg Ros improved the depth of the club, and would continue to play for the club for the coming years. The club qualified once more for the end-of-season promotion play-offs for what would be the last time until the 2017/18 season (hopefully!). The club was back up to four teams in the 2014/15 season, despite losing a number of players. Now under the Chairmanship of Rich Hayward, recruitment remained strong and the club was able to comfortably field four teams. However, the training venue at Swiss Cottage caused big problems due to a persistent leak, which some weeks put half the hall out of action. The problems with the hall were offset slightly by winning lottery funding, which enabled the club to offer training completely free for the second half of the season – a move which would attract plenty of new players to the club. On the pitch, Highbury 1 was competing in the newly formed Promotion Division. However the new format didn’t bring a change of fortunes, as they began a pattern of narrowly failing to qualify for the end-of-season promotion play-offs. Highbury returned home to north London for the 2015/16 season, playing matches and training at the Petchey Academy in Dalston, just over a mile from where the club originally started at Highbury Grove. Having training and matches in the same venue created a much more homely feel and even generated a “crowd” at some matches! Another season and another influx of players, including future Highbury 1 captain Steve Carter. Highbury 2 were also strengthened by a number of other former university players arriving at the club. One further big development was the appointment of England international Steph Allen as head coach, after several years of being chased by Mo! She set about completely changing the way Highbury play and our approach to matches. The season saw Highbury 1 agonisingly miss out on qualifying for the end-of-season promotion play-offs by losing our final fixture in the Promotion Division. However, Highbury 2 had one of its best ever campaigns and they came close to winning the league. However, losses in the final two matches meant an ultimately disappointing third place finish. Highbury 3, who only won one match in the first half of the season was boosted by the arrival of Tom Rich, who went on to score 31 goals in just six matches and Highbury 4 had a solid season in its first year back. 2016/17 saw another influx of new players, as Oxford University graduates started their evil plan to slowly to take over the club! With no fewer than four players from Oxford University, Highbury became the go-to club for Oxford grads. And with some 60 regular players the club was also able to enter five teams for the first time ever. A ‘development squad’ was introduced for the first time – comprised of Highbury 3 and 4 players, coached by Highbury 2 players Darryl Light and Rosie Oxenbury. Highbury 1 again narrowly missed out on reaching the end-of-season promotion play-offs – needing to win and Croydon to lose in the final match of the season, Highbury duly dispatched Norwich Ice (with Ally Glennie scoring nine), but Croydon also won their game to pip us to the final qualifying spot. With Steph heading off on maternity leave the club appointed Trojans player Toby Clarke as head coach for the 2017/18 season; and James Sipthorpe took over as Chair. The club continued to maintain more than 60 active players, and five teams were entered for what would be our 20th year. Darryl and Rosie continued coaching the development squad and Helen Gilmore took on the coaching of the 5th team. What will the future bring? Definitely more excitement, socials and great friendships formed. Probably a club growing further. Maybe even an England Korfball League place for our 1sts after knocking on the door for so long. Watch this space to find out! For Highury Korfball members past and present. All training sessions and home matches are played at our super training venue, Petchey Academy, in Dalston.